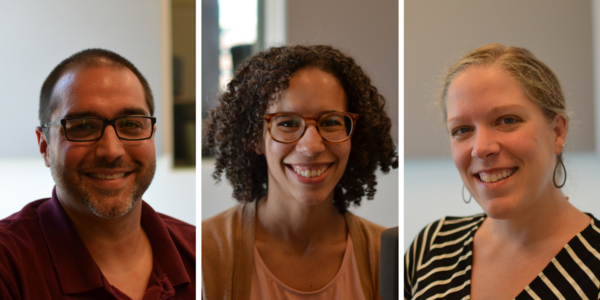 Justin Daniels, Tiana Berry-Jones and Ria Van Ryn are three of four St. Louis-based podcasters behind "Mayday: The Handmaid's Tale Podcast." It’s called “Mayday: The Handmaid’s Tale Podcast” and it is made by four local fans. Three of those fans joined the show on Tuesday to discuss what they’ve learned from the story and the fandom. Joining the program were co-hosts Justin Daniels, Ria Van Ryn and Tiana Berry-Jones. The podcast features television show recaps, highlights of social justice groups and interviews with those associated with creating “The Handmaid’s Tale” television show. Three St. Louis-based fans of "The Handmaid's Tale" discuss the growing fandom around Margaret Atwood's work and why they started a podcast about it called "Mayday: The Handmaid's Tale Podcast," with St. Louis on the Air contributing host Steve Potter.